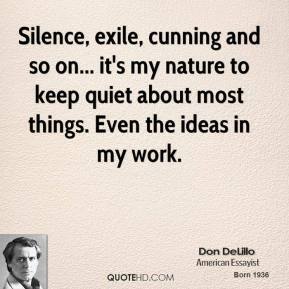 Silence, exile, cunning and so on... it's my nature to keep quiet about most things. Even the ideas in my work. I'm a quiet person. 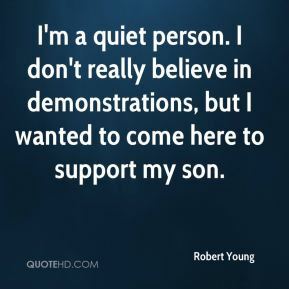 I don't really believe in demonstrations, but I wanted to come here to support my son. 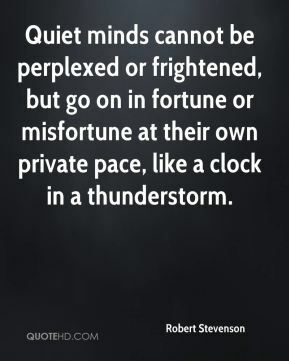 Quiet minds can't be perplexed or frightened, but go on in fortune or misfortune at their own private pace, like a clock during a thunderstorm. Things were very quiet. 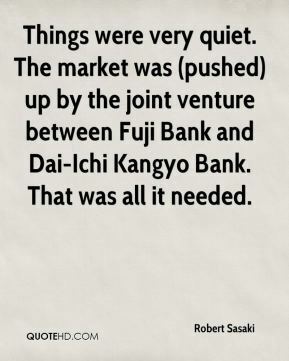 The market was (pushed) up by the joint venture between Fuji Bank and Dai-Ichi Kangyo Bank. That was all it needed. 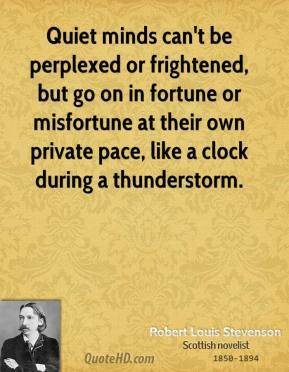 Quiet minds cannot be perplexed or frightened, but go on in fortune or misfortune at their own private pace, like a clock in a thunderstorm. 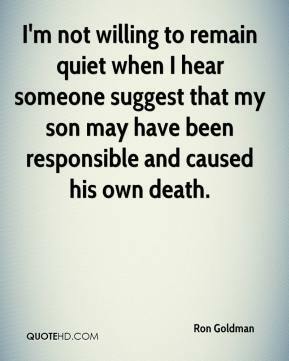 I'm not willing to remain quiet when I hear someone suggest that my son may have been responsible and caused his own death. We've been playing in some fairly quiet gyms, so this was more of a playoff-type atmosphere. 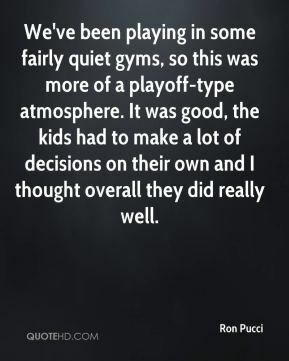 It was good, the kids had to make a lot of decisions on their own and I thought overall they did really well. 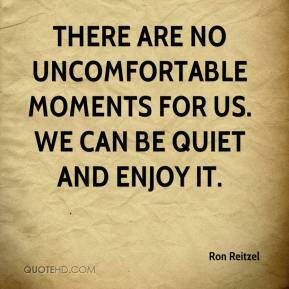 There are no uncomfortable moments for us. We can be quiet and enjoy it. 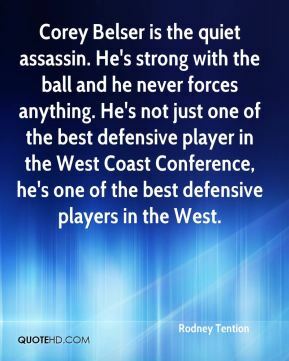 Corey Belser is the quiet assassin. He's strong with the ball and he never forces anything. He's not just one of the best defensive player in the West Coast Conference, he's one of the best defensive players in the West. 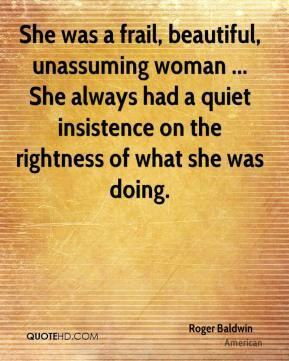 She was a frail, beautiful, unassuming woman ... She always had a quiet insistence on the rightness of what she was doing. 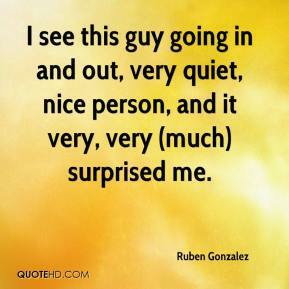 I see this guy going in and out, very quiet, nice person, and it very, very (much) surprised me. 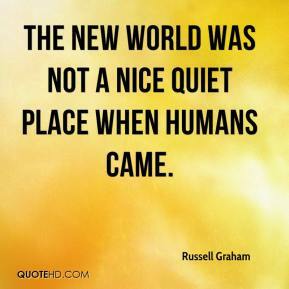 The New World was not a nice quiet place when humans came. 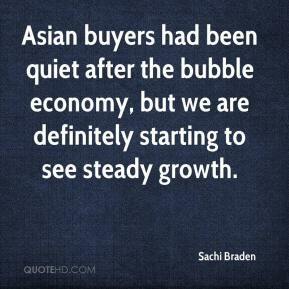 Asian buyers had been quiet after the bubble economy, but we are definitely starting to see steady growth. It?s been pretty quiet. Pretty quiet. He starts out very quiet. 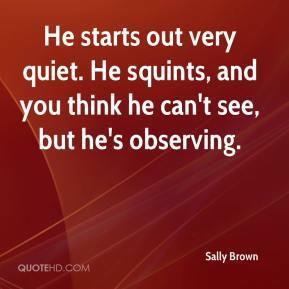 He squints, and you think he can't see, but he's observing. 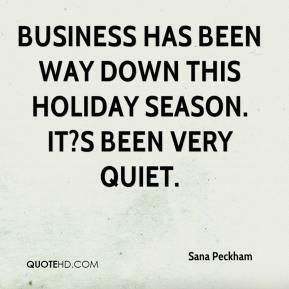 Business has been way down this holiday season. 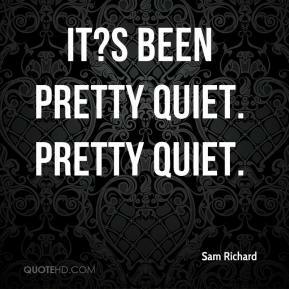 It?s been very quiet. The coach talked a lot about the graduation rate, which is about 97 percent. And it's quiet down there, so I can concentrate. It was a lovely day, so quiet. 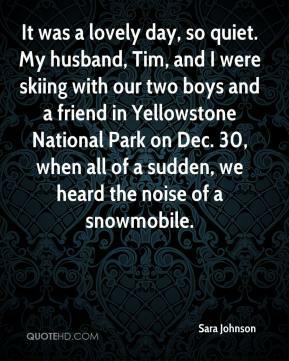 My husband, Tim, and I were skiing with our two boys and a friend in Yellowstone National Park on Dec. 30, when all of a sudden, we heard the noise of a snowmobile. 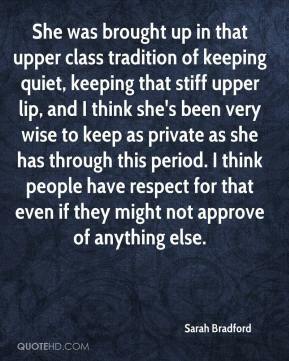 She was brought up in that upper class tradition of keeping quiet, keeping that stiff upper lip, and I think she's been very wise to keep as private as she has through this period. I think people have respect for that even if they might not approve of anything else. 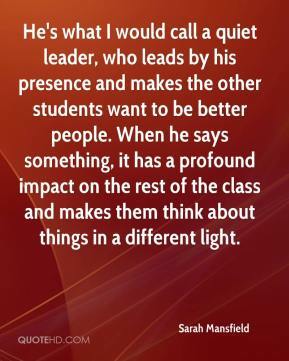 He's what I would call a quiet leader, who leads by his presence and makes the other students want to be better people. When he says something, it has a profound impact on the rest of the class and makes them think about things in a different light. 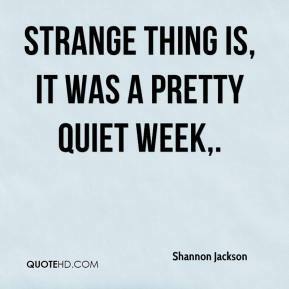 Strange thing is, it was a pretty quiet week. Midweek is always quiet, and in the pouring rain there wasn't too many people out. 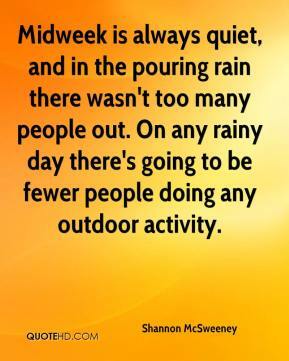 On any rainy day there's going to be fewer people doing any outdoor activity. 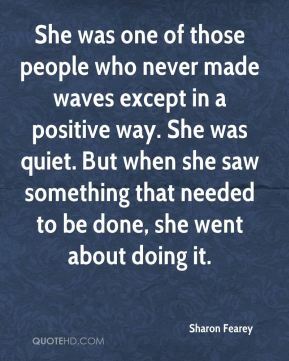 She was one of those people who never made waves except in a positive way. She was quiet. 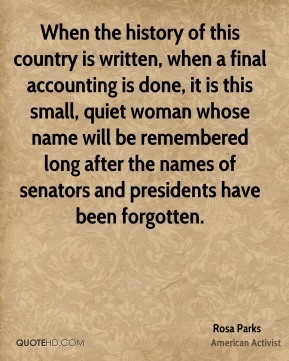 But when she saw something that needed to be done, she went about doing it. 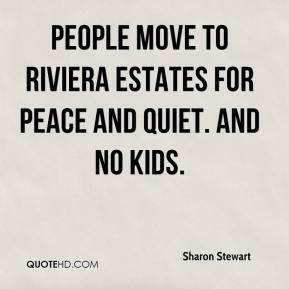 People move to Riviera Estates for peace and quiet. And no kids.